What is it? – Cargo Bridge is a game that tests your structural-engineering metal as you attempt to build stable bridges that allow your workers to collect various cargo. How does it play? – You’ll use the mouse to select bridge parts and build stable pathways across gaps in each level. You can place walkways (for the workers) and support beams. Once satisfied with your creation, set the action in motion and hope that your construction is sound. There’s no time limit, through some of the more difficult levels will require some trial-and-error. Each section of bridge you build will deplete your available cash for each level, and your score is based on how much money is left over. Initially, you’ll be building with wood, but will eventually unlock materials that support more weight – like steel. This is a good thing, since your workers will be collecting some heavy cargo. Presentation – The cartoony visuals and excellent physics compliment each other very well. In “build mode”, the view changes to a blueprint. Your builders are funny little guys, and hearing them yelp as they fall to their doom on a collapsing walkway is surprisingly funny. 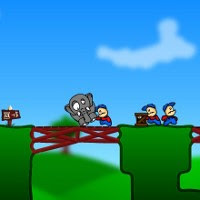 Positives – Cargo Bridge is a relaxing (yet challenging) strategy game that allows you to play at your own pace. Some of the levels are quite devious in their design, and building what you need with limited funding can be a head-scratching proposition. Negatives – Testing bridges sometimes drags in levels requiring multiple bridges. For example, if your first two bridges work like a charm, but your third bridge folds like a lawn chair, you’ll need to rewatch the action to know if your latest tweaks were effective. A fast-forward button would be a welcome addition. Why you should play it – Cargo Bridge is strategic fun that can be played in chunks. While not as intricate as a game like Incredibots, it’s a focused experience with a lot of charm. If you’re not allergic to thinking, it’s absolutely worth a gander.